I have to say it’s great being back in kitchen in La Cucina as I have a lot more time to cook and try out new recipes. I’ve made spinach and ricotta cannelloni before but have never made lasanga so I decided to give it a try last week and WOW!! It was so delicious, really moist and full of flavour, we all had it for lunch and everybody nearly licked the plates clean. 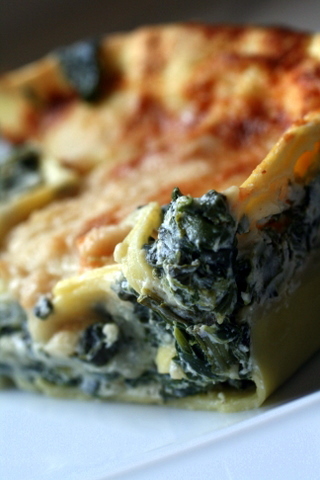 This week I’m going to make spinach, gorgonzola and pine nut lasagna, I’m so looking forward to it as I am a gorgonzola fiend. There is a little bit of work involved in this one but it is very simple to actually make, you just have to allocate a little time to it but it’s the same with all lasagna, it is not a fast food but is worth every minute of the effort. – bring a pot of water to the boil, add salt and cook your pasta sheets, 3 at at time until slightly cooked. Remove them with a slotted spoon or sieve trying not to break them and put them in a container of cold water to stop them cooking anymore. – lay the lasagna sheets out on a dry tea towel and pat them dry. – put your wet spinach on a dry pan, cover the pan and place over a medium heat and cook until tender, stirring frequently. Drain and let cool down, squeeze out excess moisture and roughly chop. 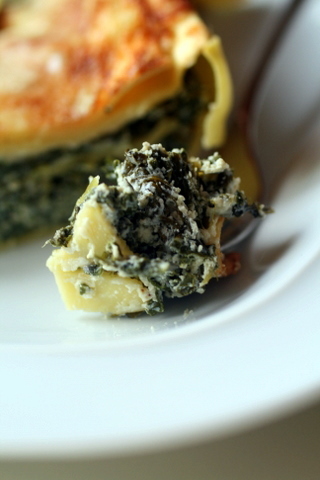 – in a bowl, mix your butter, ricotta and spinach together. Season with salt, pepper and nutmeg. – grease your oven tray with a little oil, lay down a layer of pasta, spinach mix, besciamella and sprinkle some parmesan on top. Repeat and then top with lasagna sheets, pour some besciamella on top and finish off by sprinkling lots of parmesan cheese. – bake for about 30 mins until golden brown. « linguine with tuna & tomato! ooo Lorraine gorgeous, nothing like spinach and ricotta anything!!! Divine! whay hey! I can comment again! so glad you moved…..
Will be making this one soon! Raido made me the other day Spaghetti Meatballs. And he used your recipe from the blog. Was delicious! Congratulations on the move! I must try to read you more often, though it’s hard going! around not-stopping-for lunchtime. 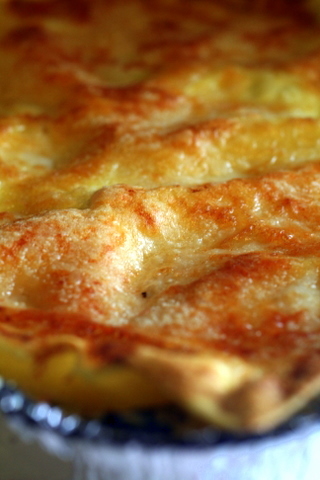 I like the new look of your blog… and your lasagne look delicious! Thanks Julian, you mean you don’t read it everyday;) tut tut! Thanks Donal, love the pics of the pies! Fixup, there is very little flavour in it but that’s where parmesan comes in. You could just use 250g ricotta as you won’t really taste it as the besciamella makes it really creamy, make sure you use lots of parmesan. re the vegetarian recipes I haven’t moved everything over yet but will be in the next few days:) I really like Ursula’s books too. 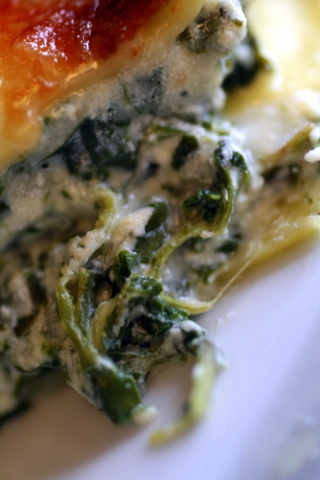 I love the look of your new blog & that gorgeous lasagne! So, I cooked it and it was nice. Bit too moist and soft for me though – I like lasagna chewy and firm. We had butternut squash risotto beforehand, and before that we had new potato, boiled egg and green bean salad, and before that we had leek and potato soup… so a bit of a feast. Anyways – the lasagna needed something else with it – tomato and rocket salad maybe. It’s too creamy to have on its own! Bare calories! oops I forgot to ask what you would have had with it? If you prefer it less creamy I would leave out the besciamella next time. Can I come to your house for dinner:) We had it on it’s own, if I was to have something with it, I’d probably just have a green salad or some bread as it’s quite rich.